Voted #3 Cigar Aficionado's Top 25 cigars of 2015! Love this size as bow pressed. Great flavor and draw. Good flavor... slow and ever burn.... amust try..
a great full bodied smoke from start to finish right to the nub. looks great, well constructed, great flavor, draws and burns evenly. another top notch smoke from start to finish. nice full bodied flavor, well constructed, draws nicely and burns evenly. These were good. I'll probably reorder these sometime. The big guy knocks it out of the park. All I have turned this bad boy onto asks what have they been smoking. Even burn with great draw. Just nicely wrapped cigar!! Take a couple hours to sit and enjoy this awesome stick! Deep rich flavors and flawless construction. Definitely my favorite CAO stick! I consider the v660 as one of my go to cigars. It's a solid smoke and gives good value. 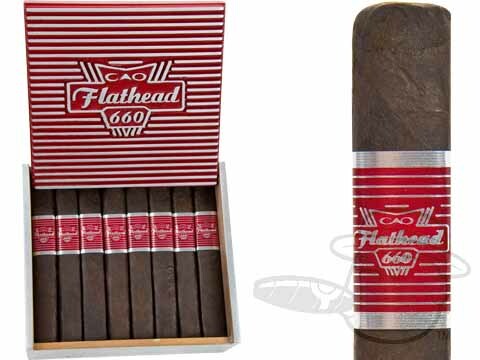 CAO Flathead V660 Carb is rated 4.4 out of 5 based on 24 customer ratings.